2,265 sessions from June 13 to July 14, 2018. 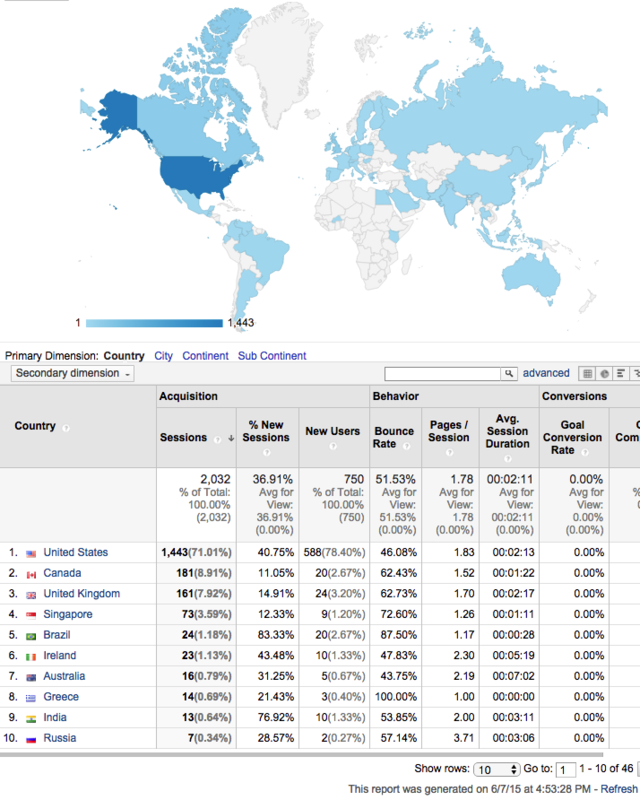 Average about 73 sessions per day, from 49 countries, speaking 32 languages. 53% access on desktop computer, 39% access with mobile device (iPhone, Android), 8% access with tablet. 2,574 sessions from May 4, to June 3, 2018. Average about 83 sessions per day, from 46 countries, speaking 28 languages. 55% access on desktop computer, 37% access with mobile device (iPhone, Android), 6% access with tablet. 2,649 sessions from March 8, to April 7, 2018. Average about 85 sessions per day, from 48 countries, speaking 29 languages. 74% were new visits. 55% access on desktop computer, 35% access with mobile device (iPhone, Android), 10% access with tablet. 2,532 visits from January 11, to February 10, 2018. 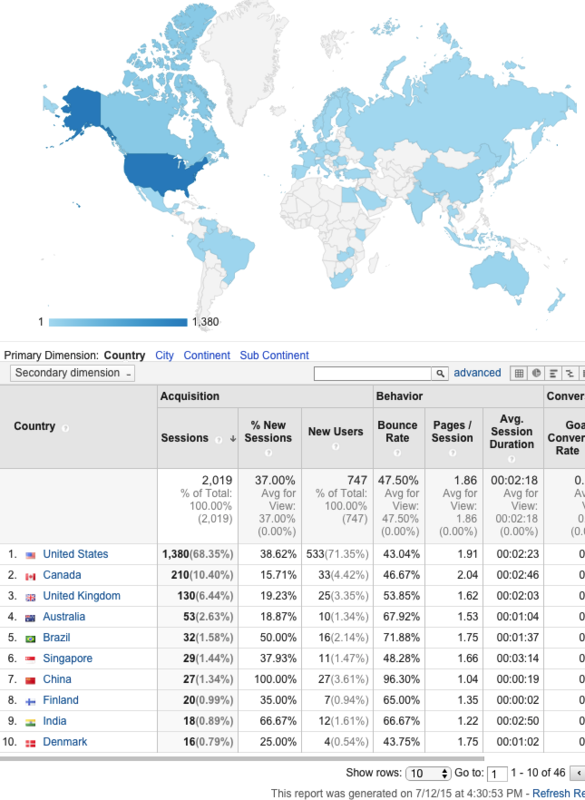 Average about 90 visits per day, from 44 countries, speaking 33 languages. 74% were new visits. 52% access on desktop computer, 40% access with mobile device (iPhone, Android), 8% access with tablet. 2,369 visits from November 3, to December 2, 2017. 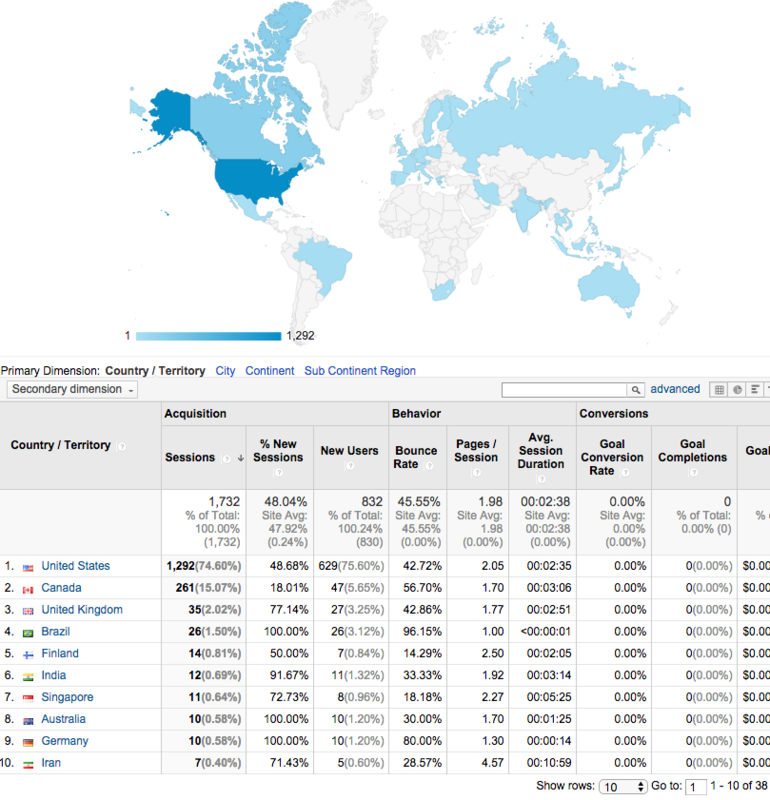 Average about 79 visits per day, from 43 countries, speaking 18 languages. 34% were new visits. 53% access on desktop computer, 40% access with mobile device (iPhone, Android), 7% access with tablet. 2,395 visits from October 5 to November 4, 2017. 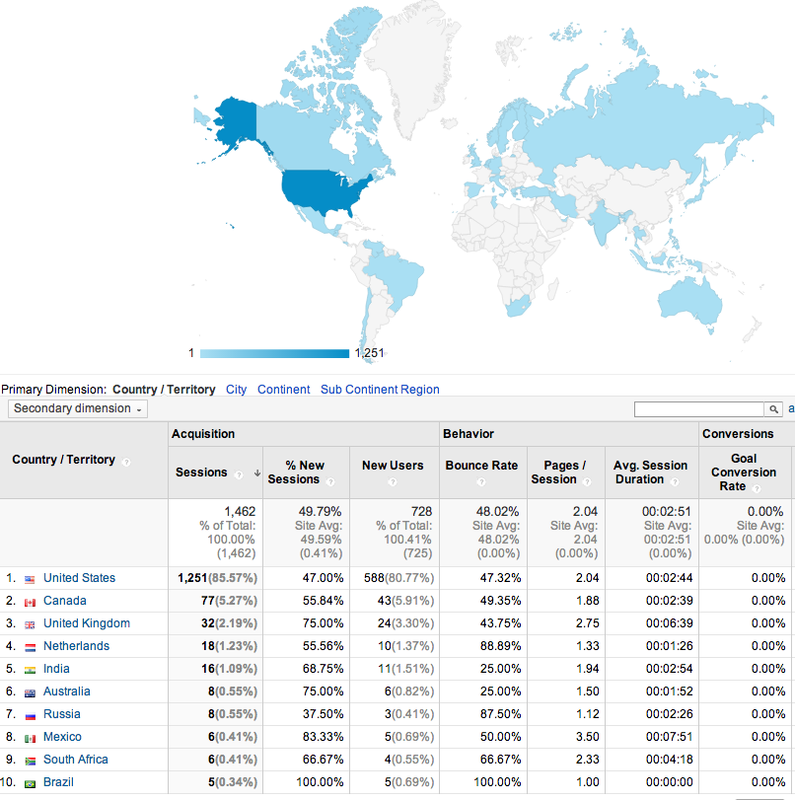 Average about 77 visits per day, from 42 countries, speaking 24 languages. 34% were new visits. 55% access on desktop computer, 37% access with mobile device (iPhone, Android), 8% access with tablet. 2,277 visits from Aug 30 to Sept 28, 2017. 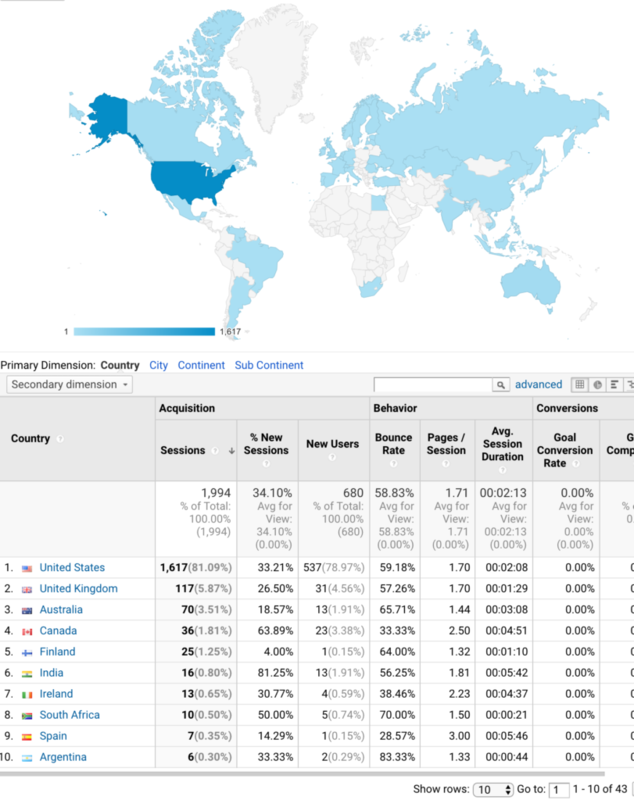 Average about 76 visits per day, from 40 countries, speaking 28 languages. 30% were new visits. 51% access on desktop computer, 38% access with mobile device (iPhone, Android), 10% access with tablet. 2,294 visits from August 9 to September 10, 2017. 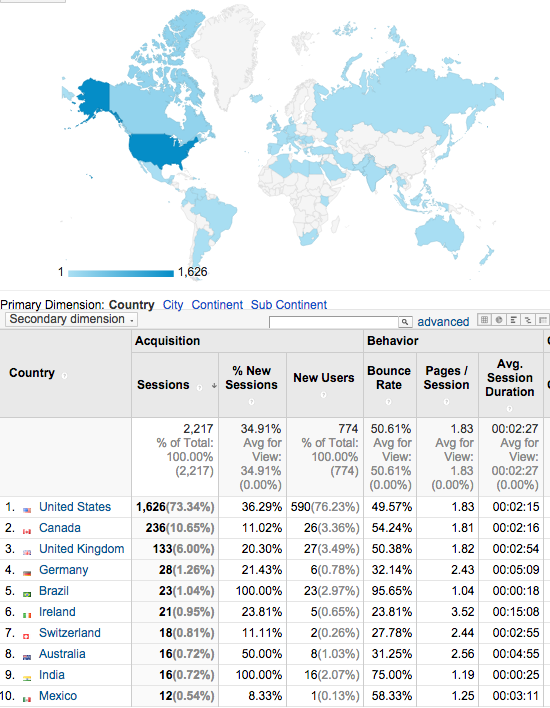 Average about 74 visits per day, from 36 countries, speaking 24 languages. 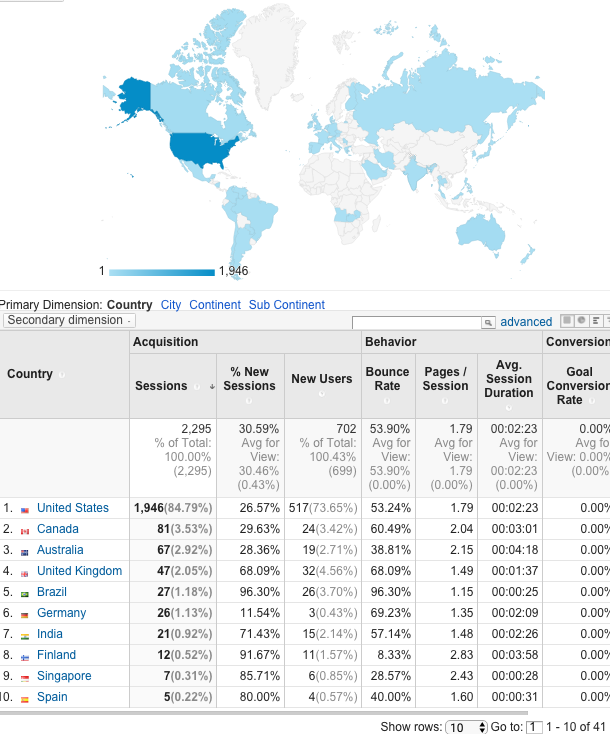 27.2% were new visits. 51% access on desktop computer, 35% access with mobile device (iPhone, Android), 13% access with tablet. 2,046 visits from July 1 to July 31, 2017. 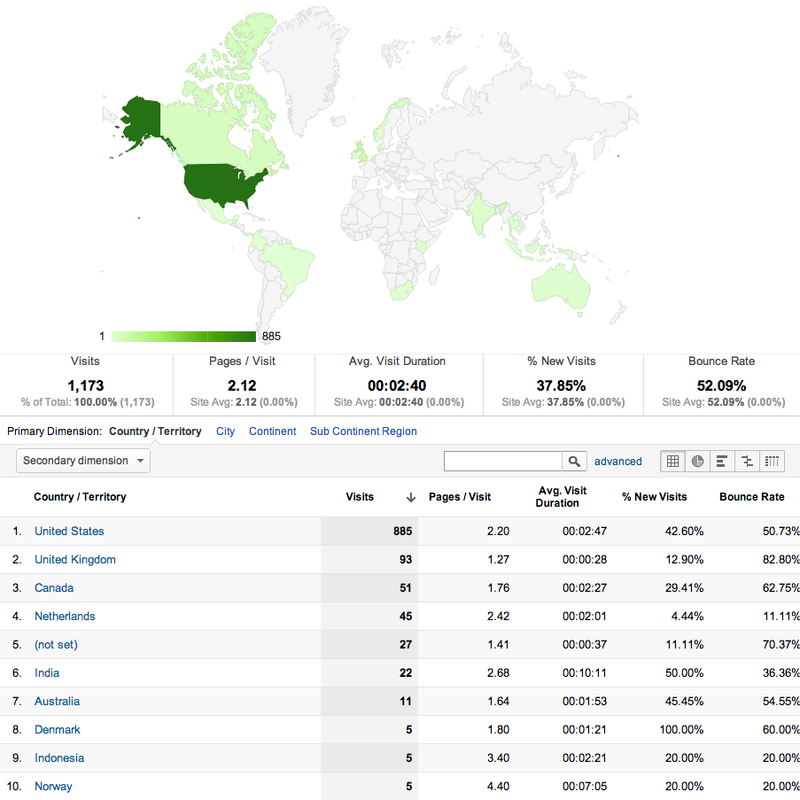 Average about 66 visits per day, from 41 countries, speaking 24 languages. 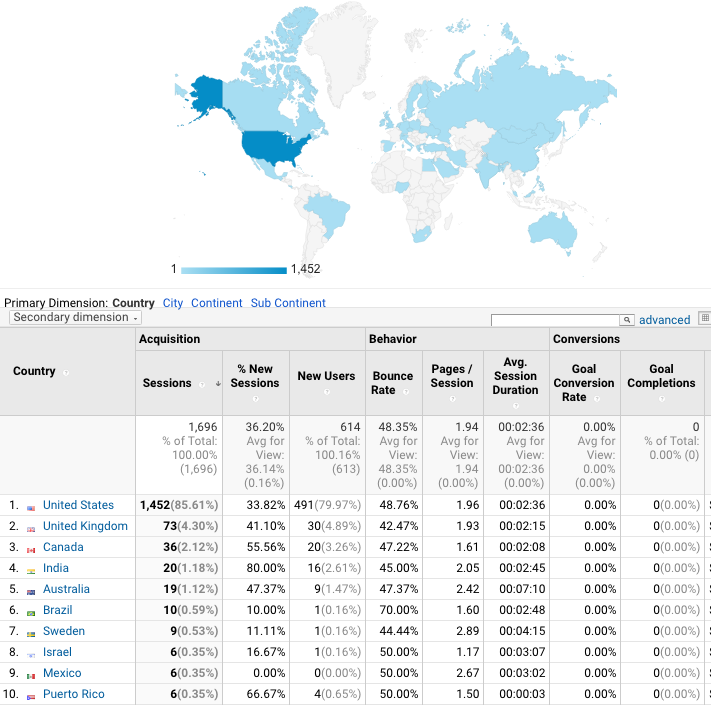 31.9% were new visits. 52% access on desktop computer, 38% access with mobile device (iPhone, Android), 9% access with tablet. 1,981 visits from April 30 to May 30, 2017. 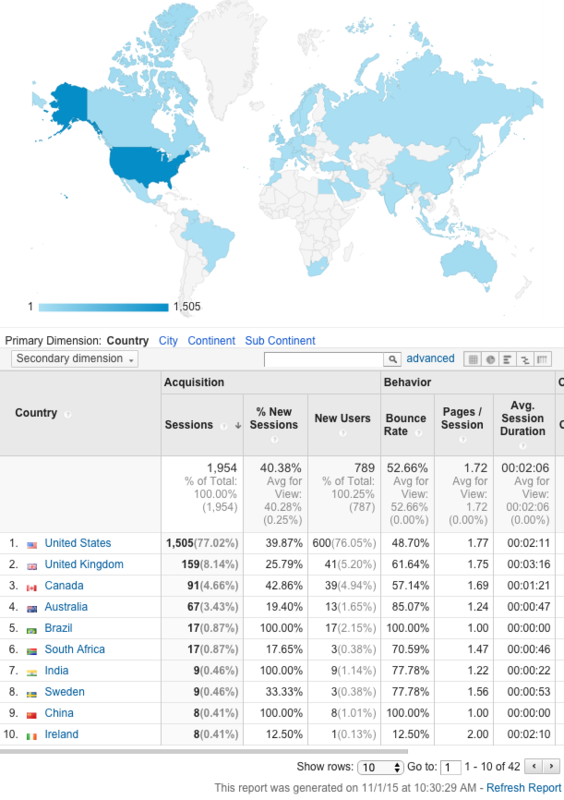 Average about 64 visits per day, from 40 countries, speaking 25 languages. 34% were new visits. 55% access on desktop computer, 39% access with mobile device (iPhone, Android), 6% access with tablet. 1,994 from April 7 to May 6, 2017. 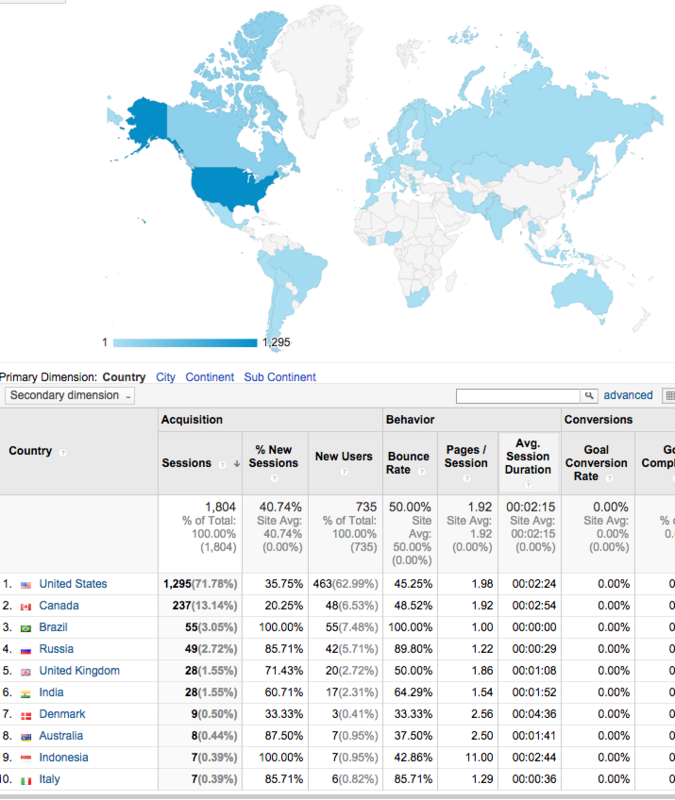 Average about 66 visits per day, from 43 countries, speaking 23 languages. 34% were new visits. 55% access on desktop computer, 40% access with mobile device (iPhone, Android), 5% access with tablet. 1,891 from Feb. 5 to March 4, 2017. 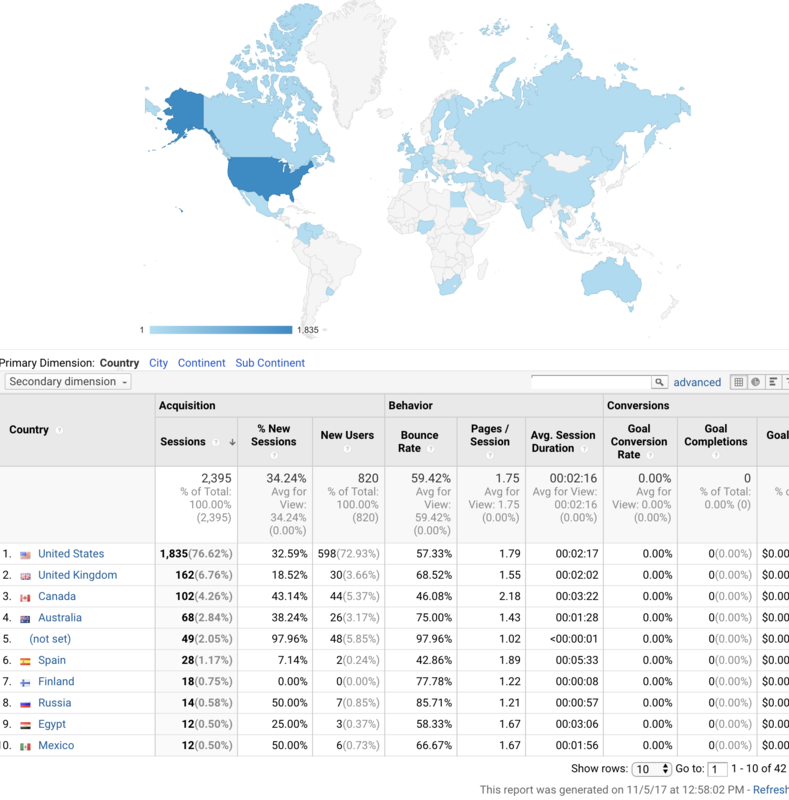 Average about 68 visits per day, from 35 countries, speaking 23 languages. 36% were new visits. 57% access on desktop computer, 36% access with mobile device (iPhone, Android), 7% access with tablet. 2,384 visitors from 44 countries around the world January 10 – February 11, 2017. 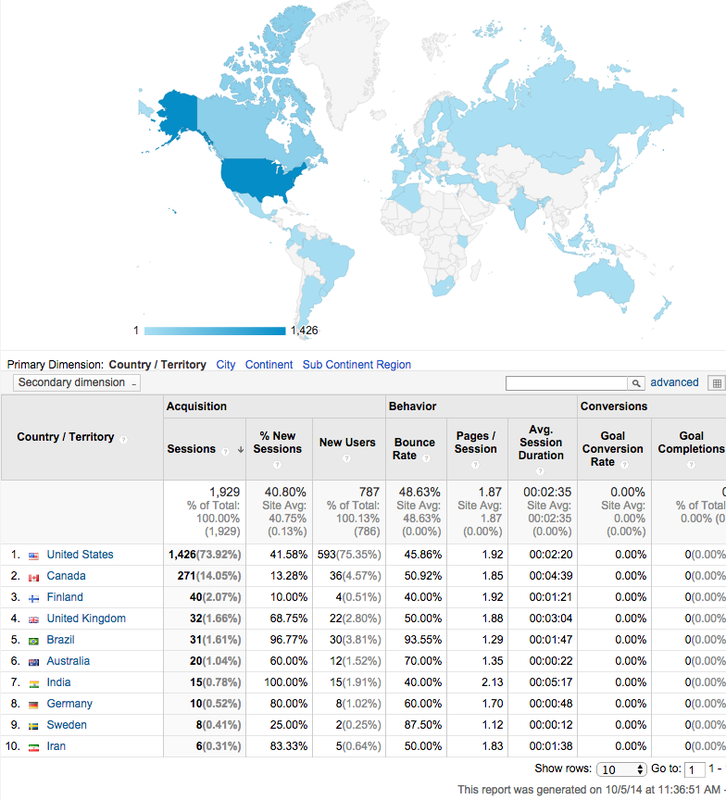 Average about 77 visits per day, speaking 29 languages. 37% were new visits. 59% access on desktop computer, 34% access with mobile device (iPhone, Android), 7% access with tablet. 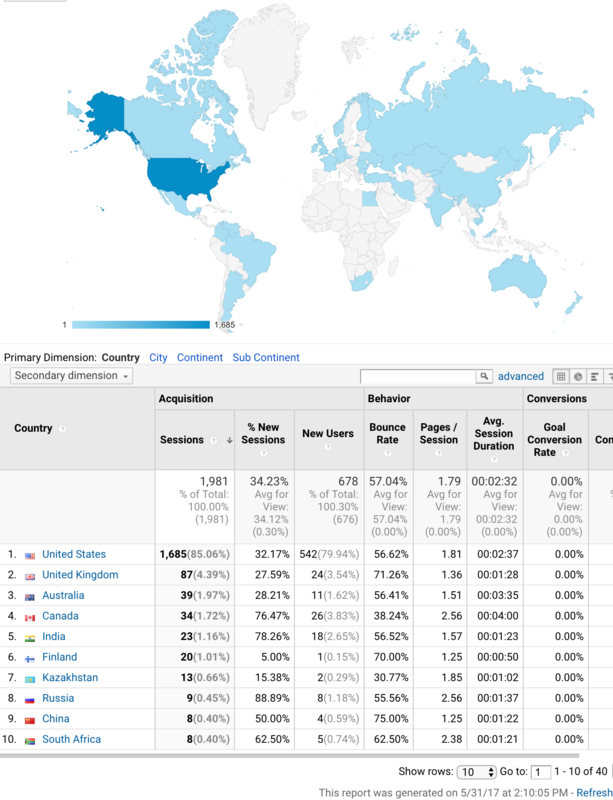 1,696 visits from 40 countries around the world December 8, 2016 through January 7, 2017. Average about 55 visits per day, speaking 25 languages. 36% were new visits. 56% access on desktop computer, 37% access with mobile phone (iPhone, Android), 6% access with tablet. 1,722 visitors from 30 countries around the world Nov. 3 – Dec 3, 2016. Average about 57 visits per day, speaking 23 languages. 33% were new visits. 53% access on desktop computer, 40% access with mobile device (iPhone, Android), 6% access with tablet. Visits are down, but access with mobile devices has risen again. 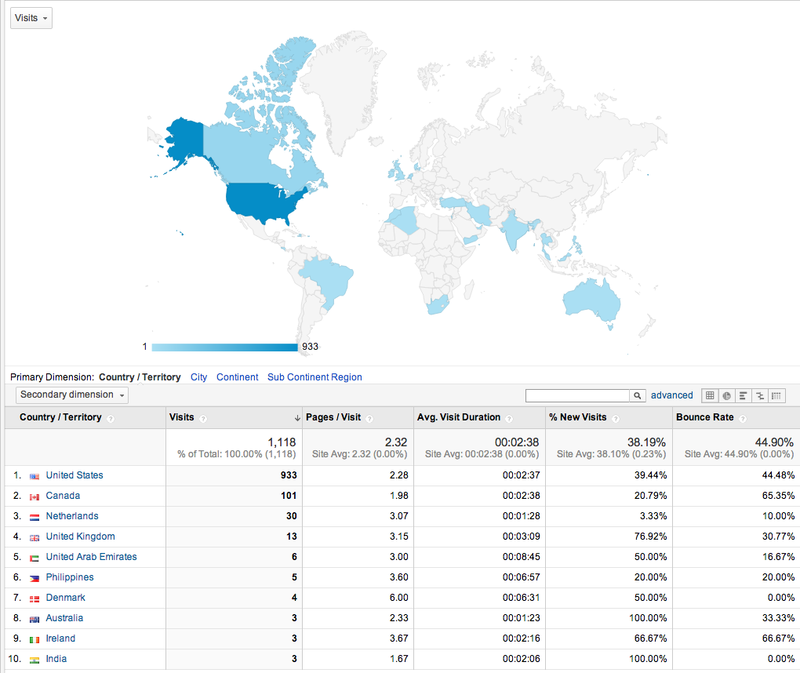 2,295 visitors from 41 countries around the world June 5 through July 10, 2016. Average about 68 visits per day, speaking 30 languages. 30% were new visits. 55% access on desktop computer, 37% access with mobile phone (iPhone, Android), 8% access with tablet. Continuing to increase mobile device access. 2,071 visitors from 45 countries around the world May 5 through June 4, 2016. Average about 67 visits per day, speaking 33 languages. 33% were new visits. 57% access on desktop computer, 36% access with mobile phone (iPhone, Android), 7% access with tablet. 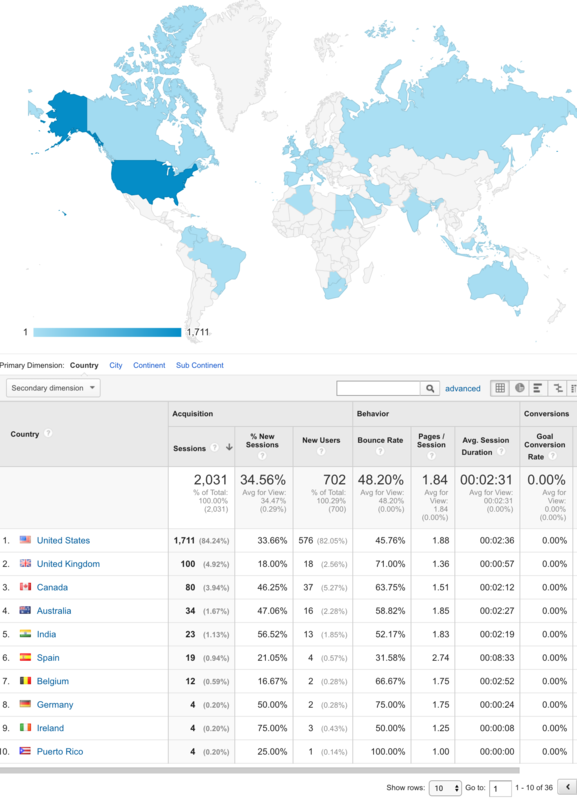 1,993 visitors from 39 countries around the world Mar 31, 2016–Apr 30, 2016. Average about 65 visits per day, speaking 34 languages. 36% were new visits. 58% access on desktop computer, 32% access with mobile device (iPhone, Android), 9% access with tablet. 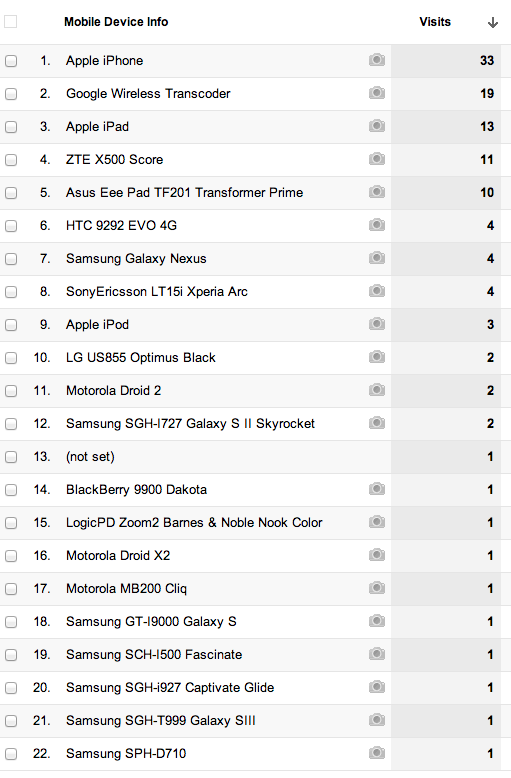 Interestingly, the tablet users viewed more pages and spent more time on our website than desktop or smart phone users. 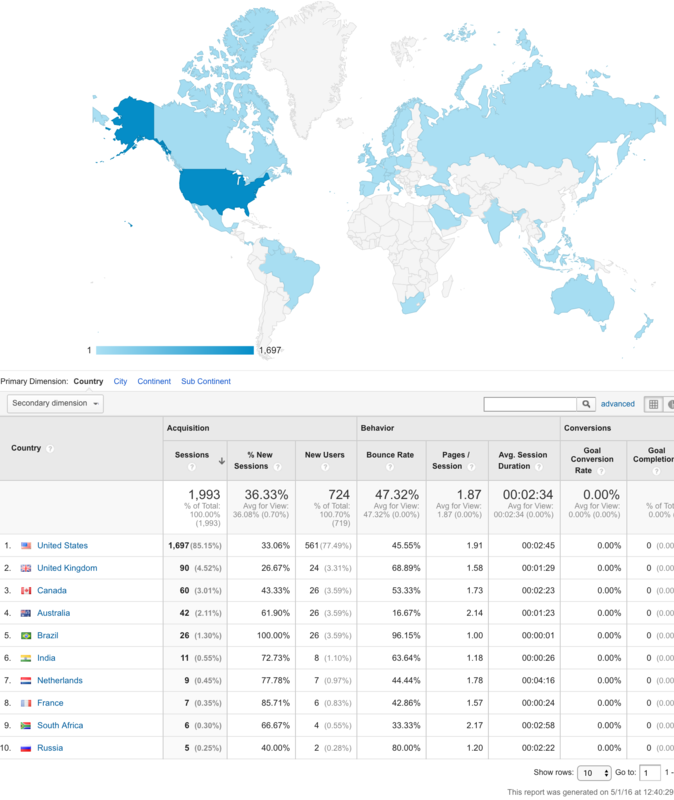 2,031 visitors from 36 countries around the world March 3, 2016 through April 2, 2016. Average about 66 visits per day, speaking 24 languages. 35% were new visits. 58% access on desktop computer, 33% access with mobile device (iPhone, Android), 9% access with tablet. 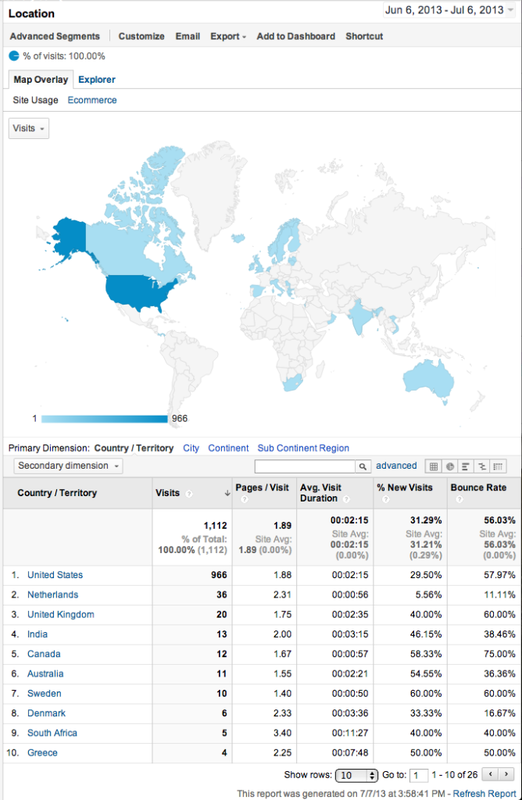 1,954 visitors from 42 countries around the world October 1, 2015 through October 31, 2015. Average about 63 visits per day, speaking 31 languages. 40% were new visits (all increase). 52% access on desktop computer (decrease), 34% access with mobile phone (iPhone, Android) (increase), 14% access with tablet,(increase). Continuing to increase mobile device access. 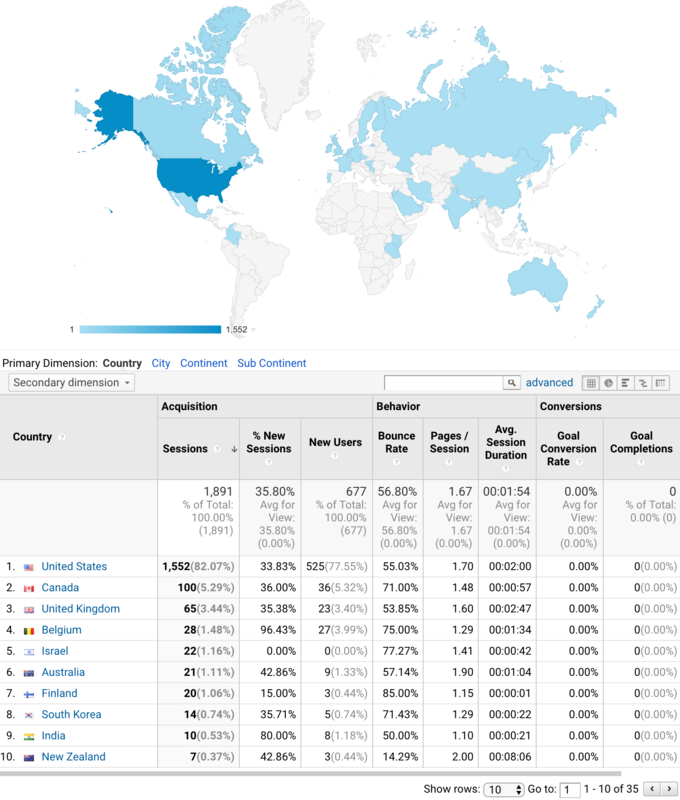 1,800 visitors from 33 countries around the world August 13, 2015 through September 13, 2015. Average about 60 visits per day, speaking 25 languages. 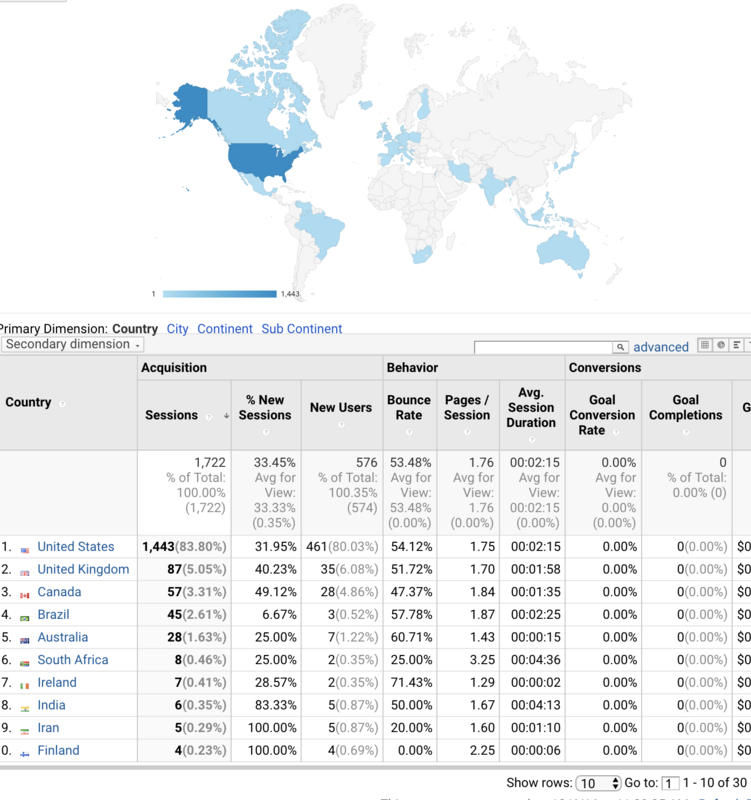 38% were new visits (increase). 60% access on desktop computer (steady), 30% access with mobile phone (iPhone, Android) (increase), 9% access with tablet (decrease). Continuing to increase mobil phone access. 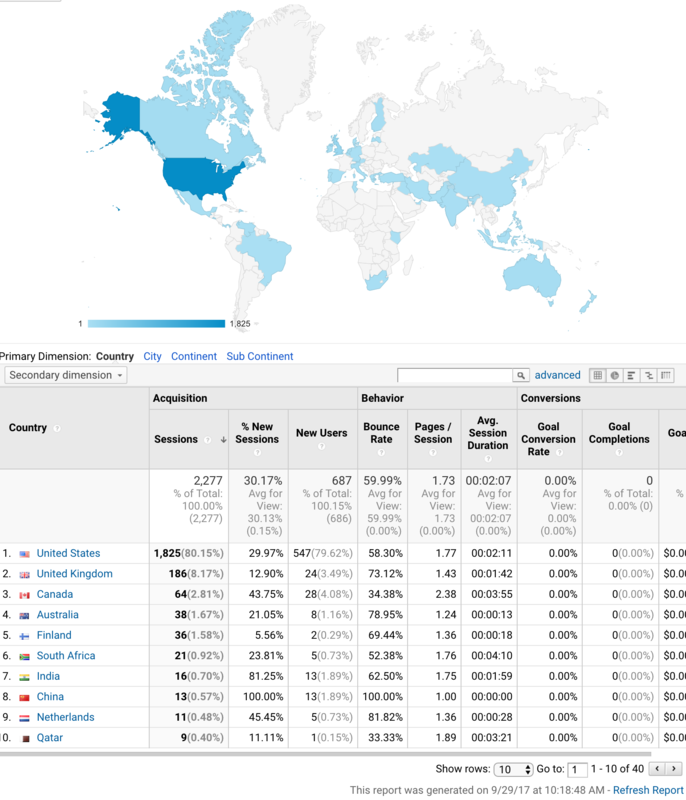 2,038 visitors from 46 countries around the world July 2, 2015 through August 1, 2015. Average about 66 visits per day, speaking 28 languages. 37% were new visits. 60% access on desktop computer (decrease), 28% access with mobile device (iPhone, Android)(increase), 12% access with tablet. Continuing to increase mobile device access and decrease desktop computer access. 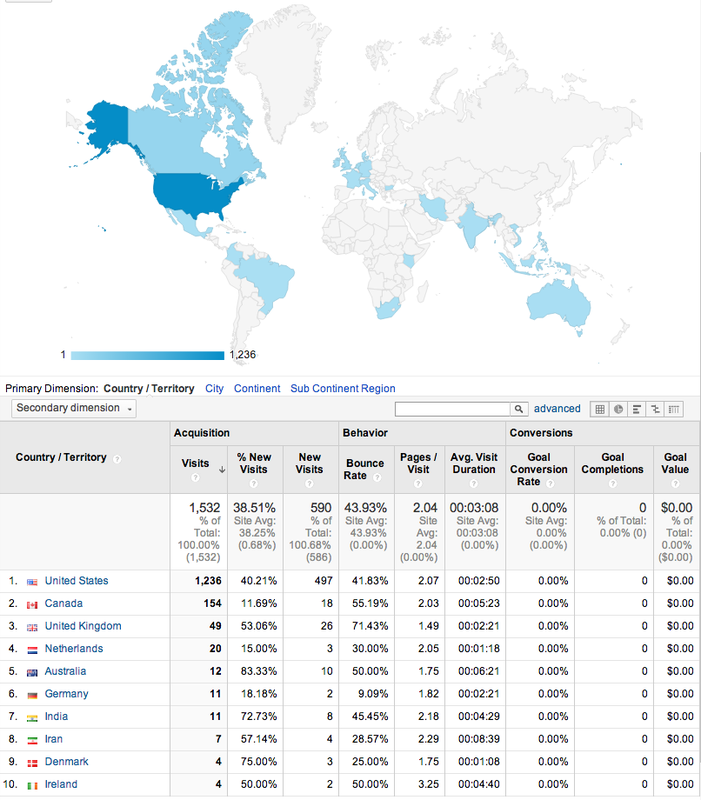 2,019 visitors from 46 countries around the world June 11, 2015 through July 11, 2015. 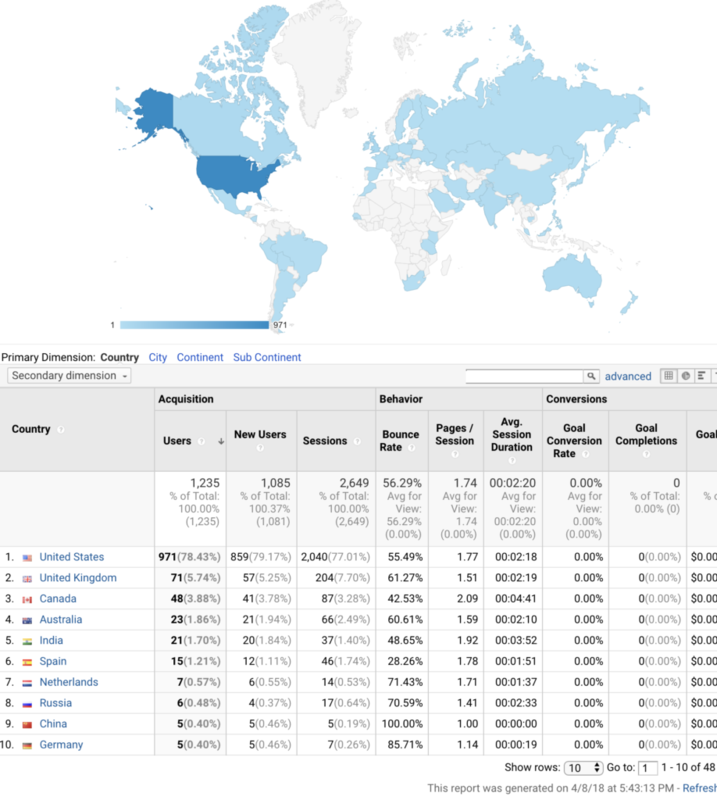 Average about 67 visits per day, speaking 31 languages. 37% were new visits. 61% access on desktop computer (decrease), 26% access with mobile device (iPhone, Android)(increase), 12% access with tablet (decrease). Continuing to increase mobile device access and decrease desktop computer access. 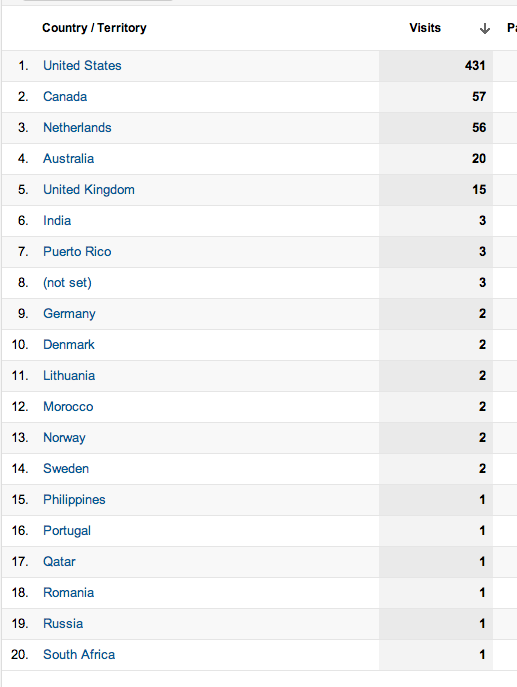 Please note that users from Finland, Denmark and Singapore have visited our website. Word is getting around! 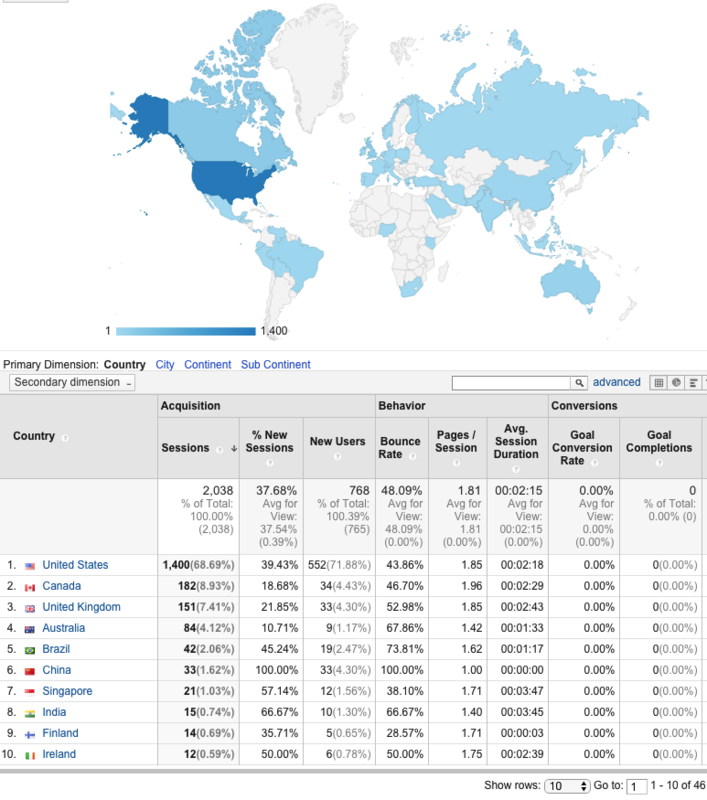 2,032 visitors from 46 countries around the world May 7, 2015 through June 6, 2015. Average about 65 visits per day, speaking 32 languages. 37% were new visits. 63% access on desktop computer (decrease), 22% access with mobile device (iPhone, Android)(increase), 15% access with tablet (increase). Continuing to increase mobile device access and decrease desktop computer access. 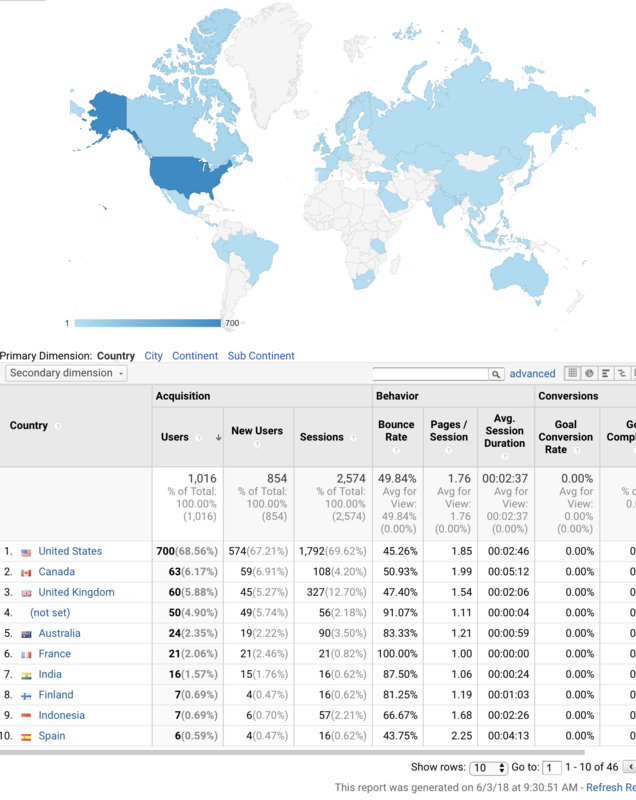 1,732 visitors from 38 countries around the world October 2, through November 1, 2014. 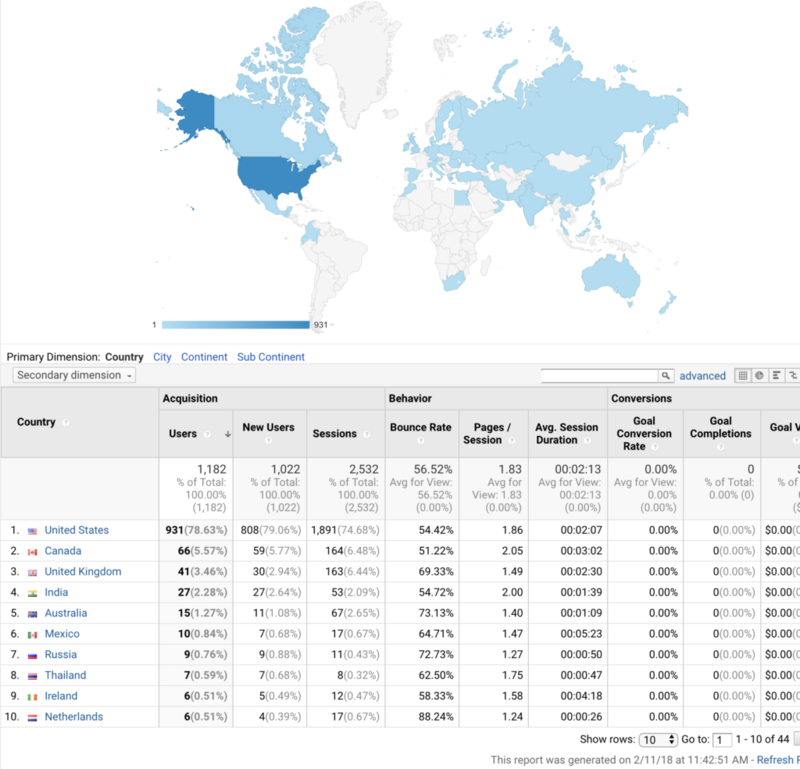 Average about 55 visits per day, speaking 33 languages. 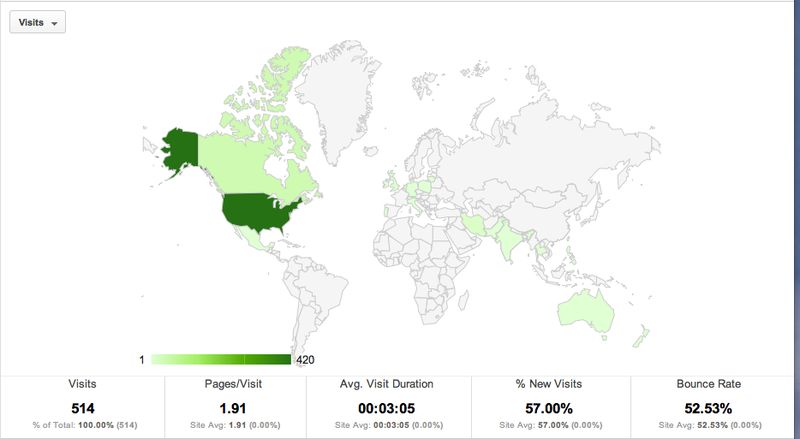 48%, or 832 new visits. 67% access on desktop computer (decrease), 23% access with mobile device (iPhone, Android), 10% access with tablet. 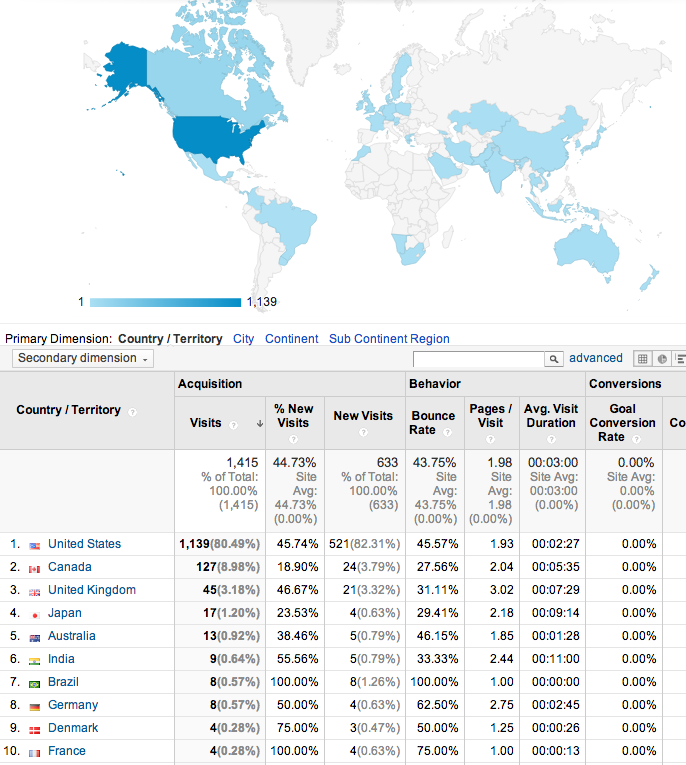 1,929 visitors from 49 countries around the world September 4, through October 4, 2014. 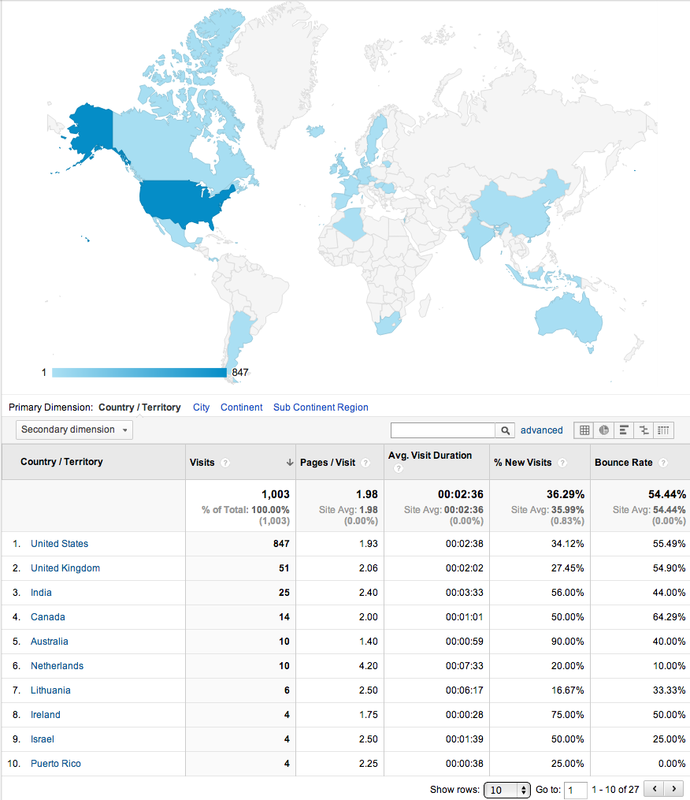 Average over 60 visits per day, speaking 35 languages. 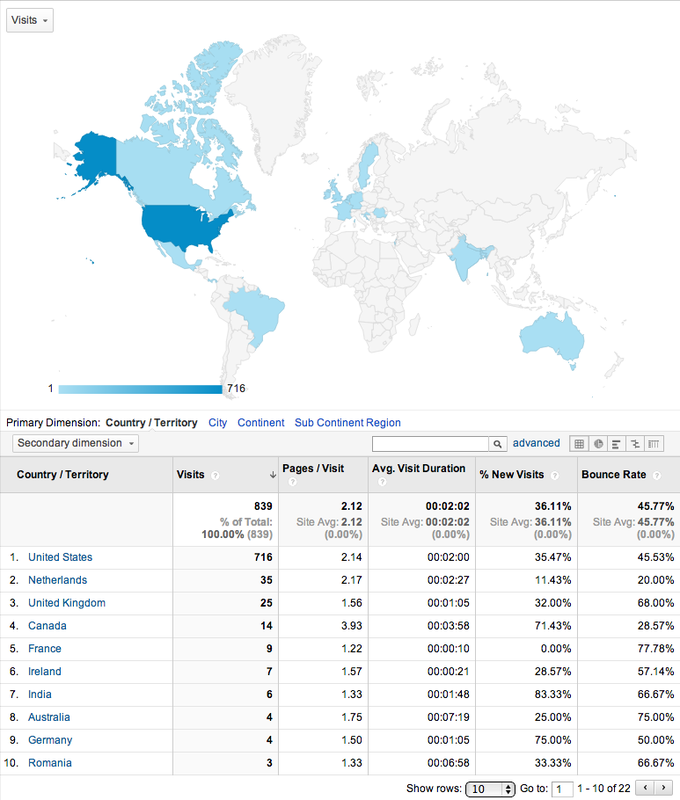 41%, or 787 new visits. 73% access on desktop computer (decrease), 19% access with mobile device (iPhone, Android), 8% access with tablet. 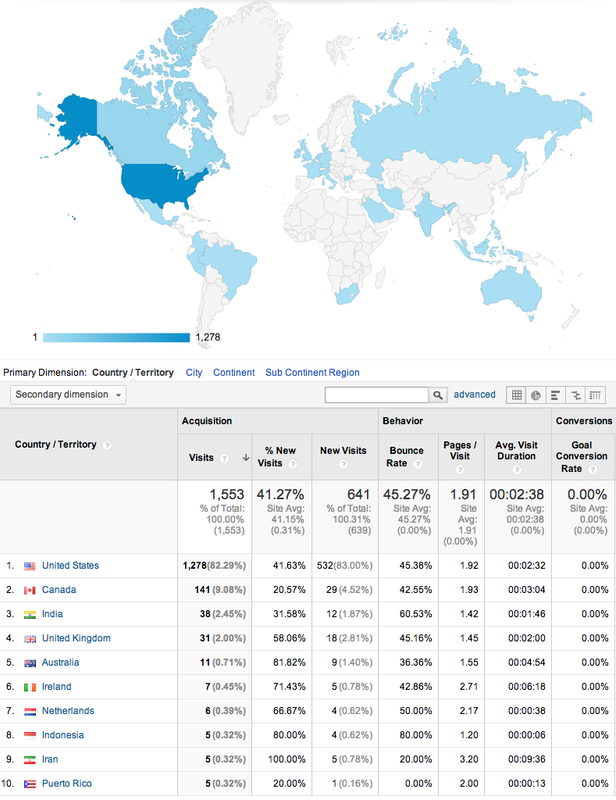 1,928 visitors from 47 countries around the world August 7 through September 6, 2014. 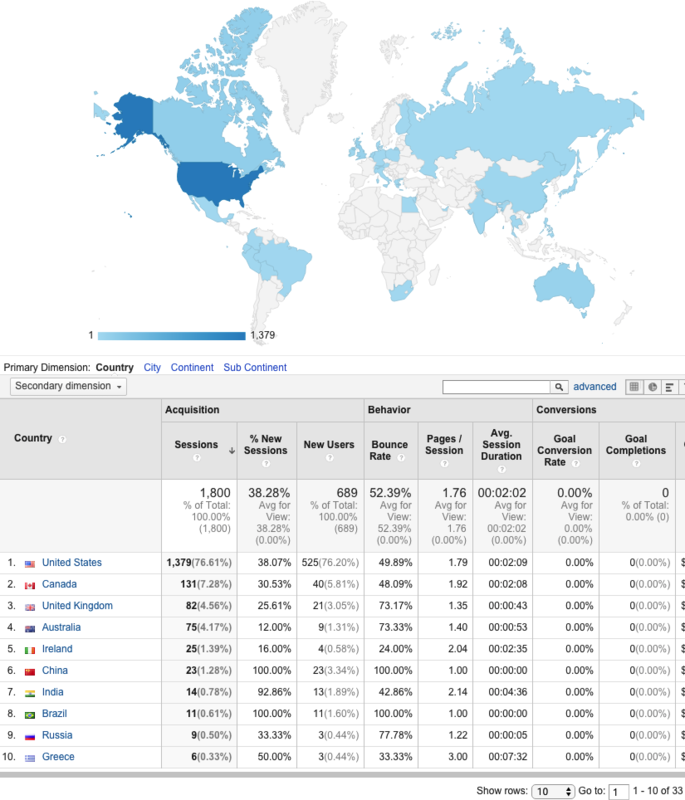 Average over 60 visits per day, speaking 31 languages. 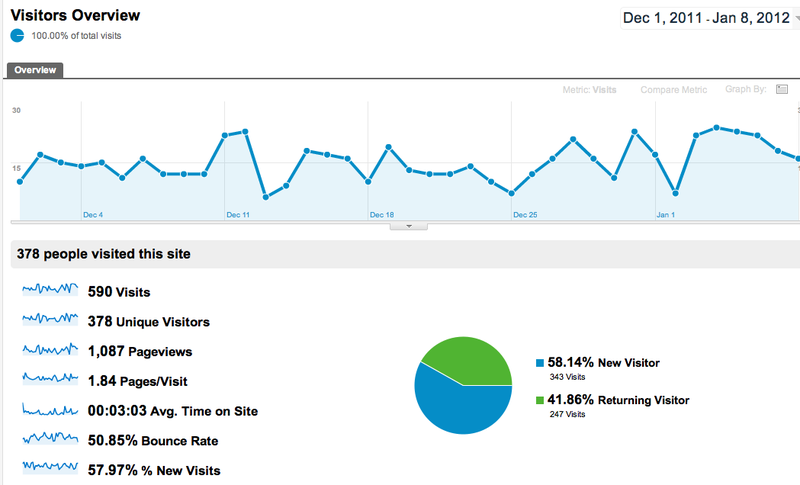 40%, or 774 new visits. 76% access on desktop computer, 17% access with mobile device (iPhone, Android), 7% access with tablet. 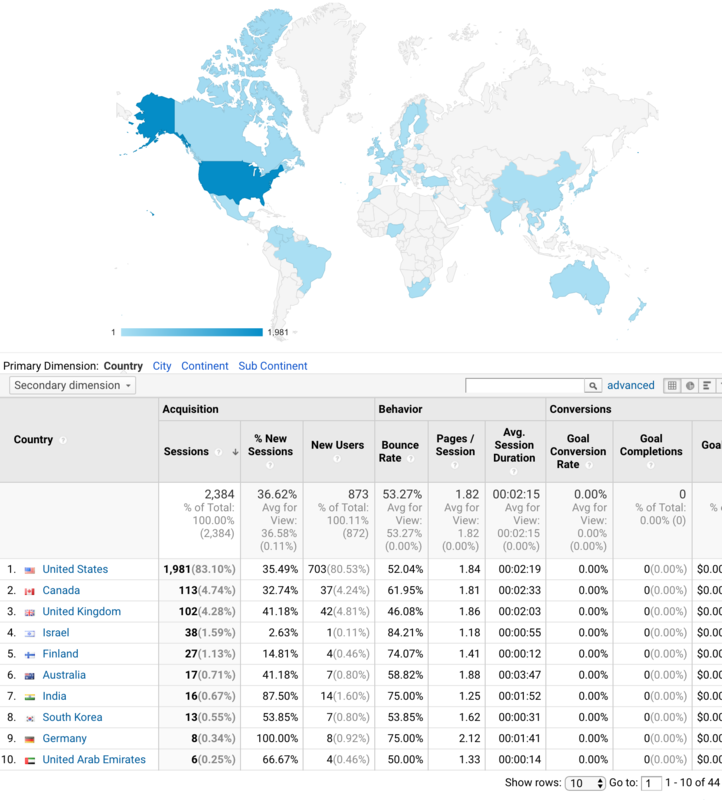 1,462 Visitors from 33 countries around the world June 5 through July 5, 2014. Average ~50 per day, speaking 26 languages. 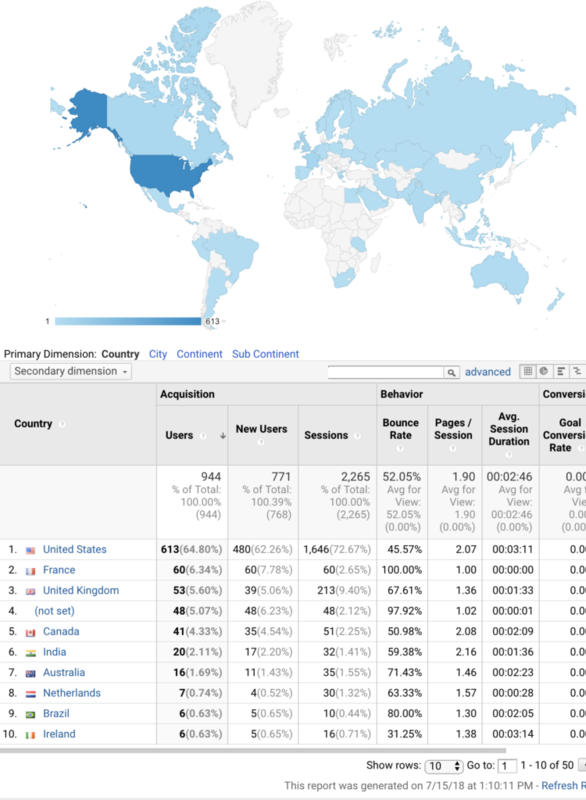 Almost 50%, or 728 new visits. 75% access on desktop computer, 18% access with mobile device (iPhone, Android), 8% access with tablet. 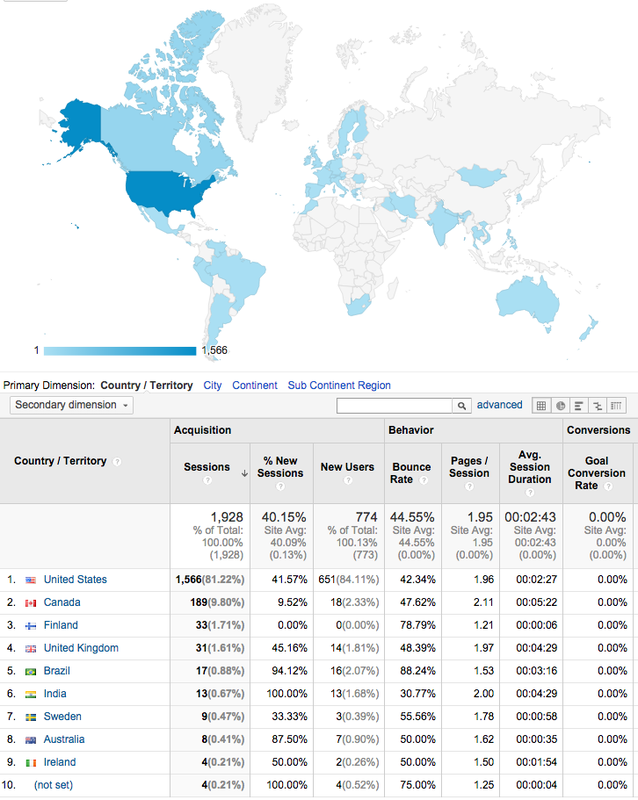 1,415 Visitors from 40 countries around the world March 6 through April 5, 2014. Average 50+ per day, speaking 31 languages. 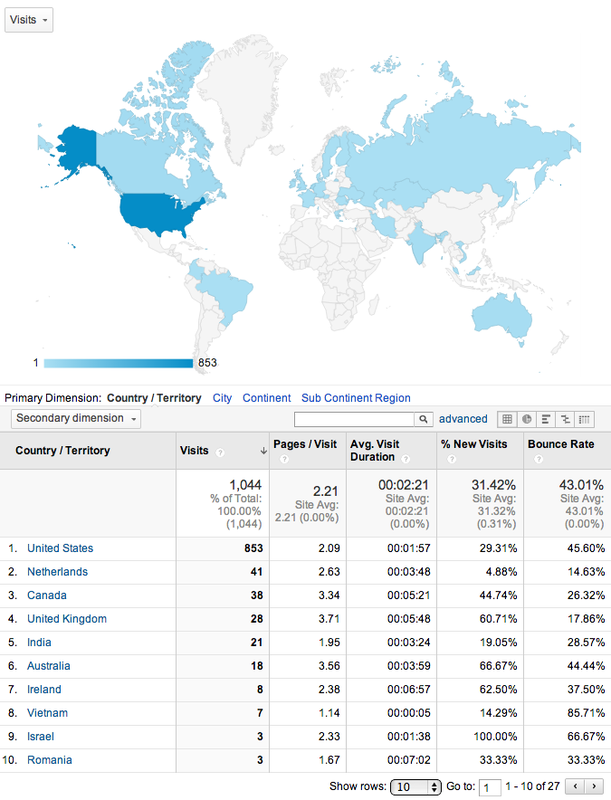 Over 40%, or 633 new visits. 80% access on desktop computer, 11% access with mobile device (iPhone, Android), 8% access with tablet. 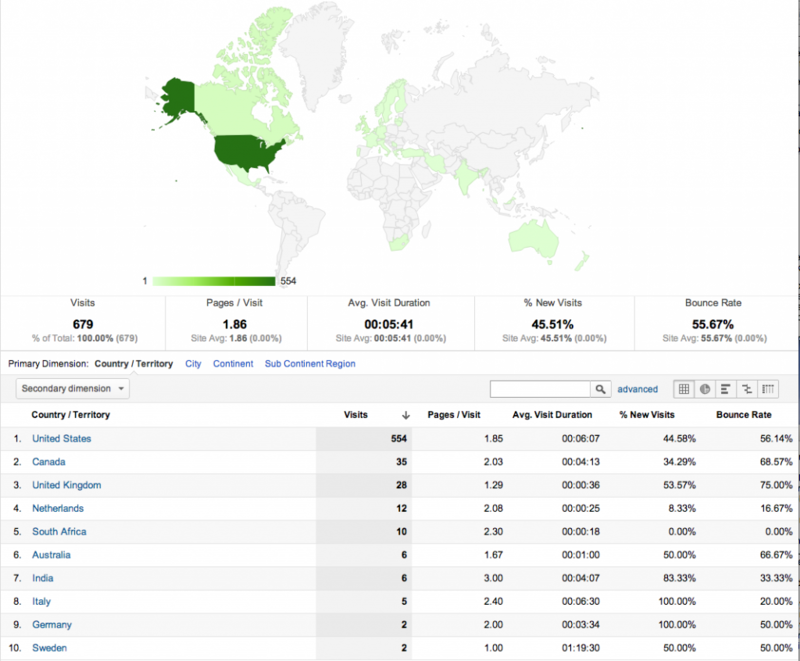 1,553 Visitors from 27 countries around the world January 30 through March 1, 2014. Average 50+ per day, speaking 13 languages. 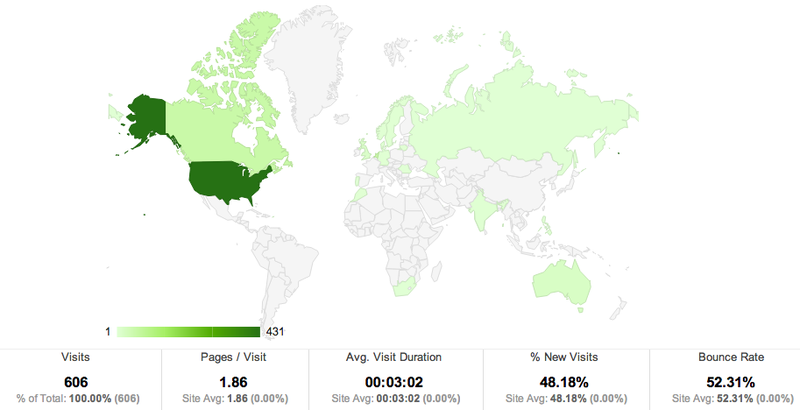 Over 40%, or 641 new visits. 76% access on desktop computer, 12% access with mobile device (iPhone, Android), 10% access with tablet. 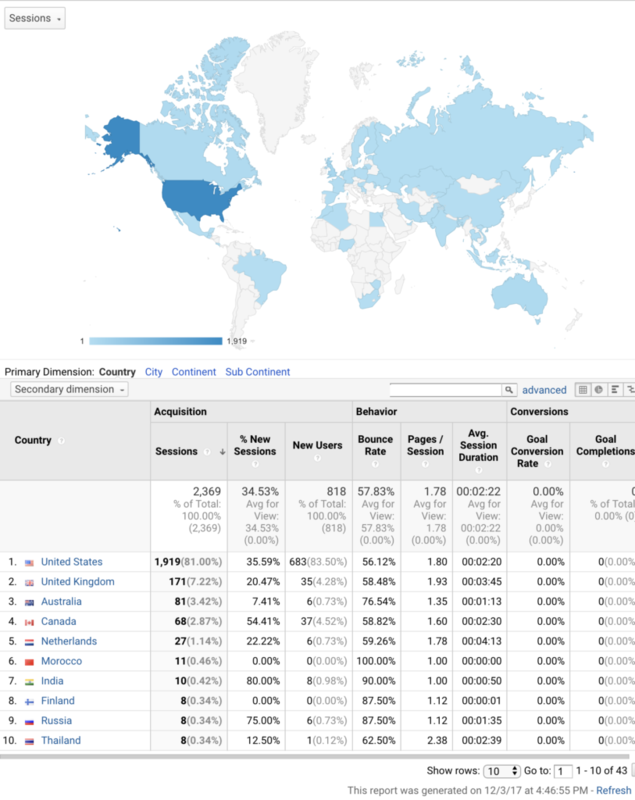 1,532 Visitors from 25 countries around the world January 9 through February 8, 2014. Average 50 per day, speaking 16 languages. 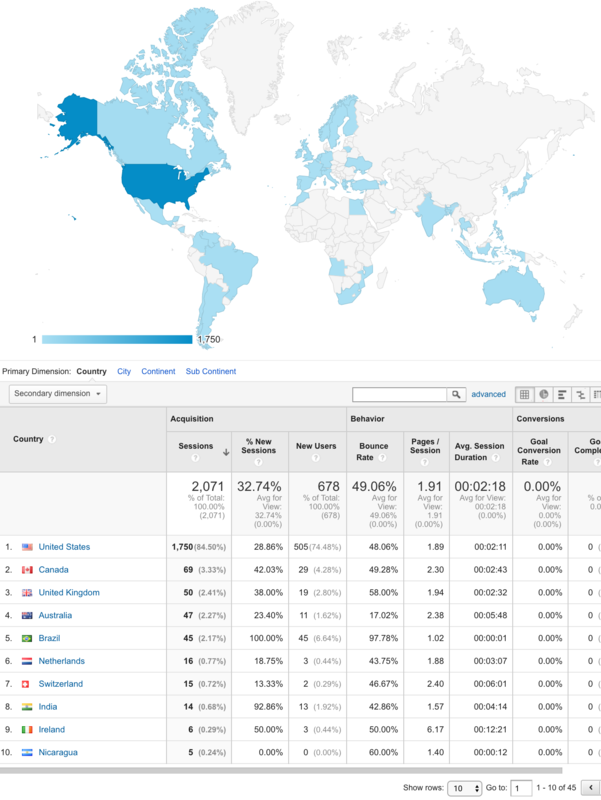 1,118 Visitors from 25 countries around the world October 31 to November 30, 2013. 12 languages spoken. Over 1/3 are new visits, 2/3 are return visits. 37% access on desktop computer, 46% access with mobile device, 32% access with tablet. 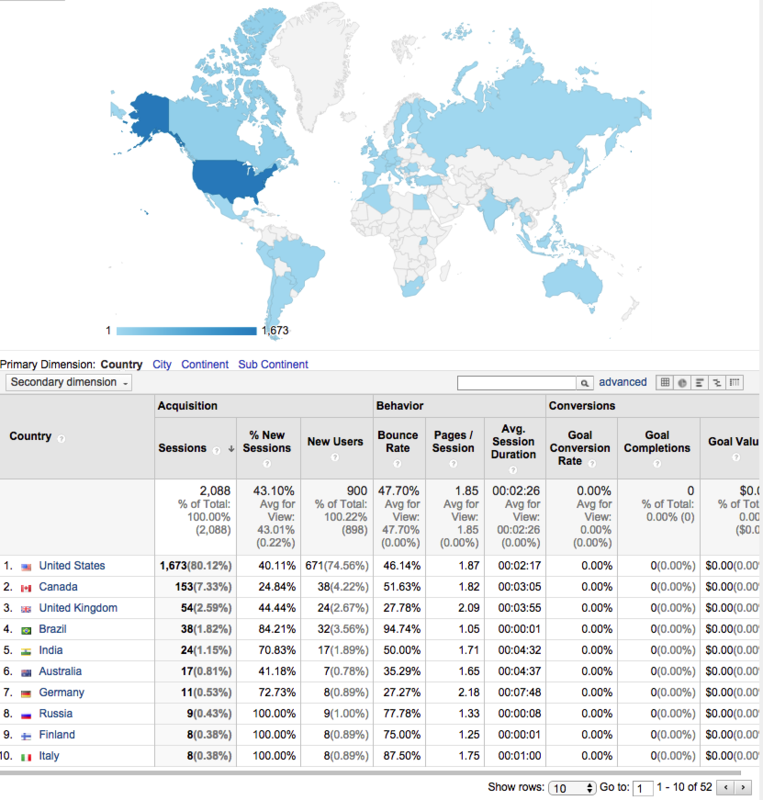 Visitors from 27 countries around the world September 5 to October 5, 2013. 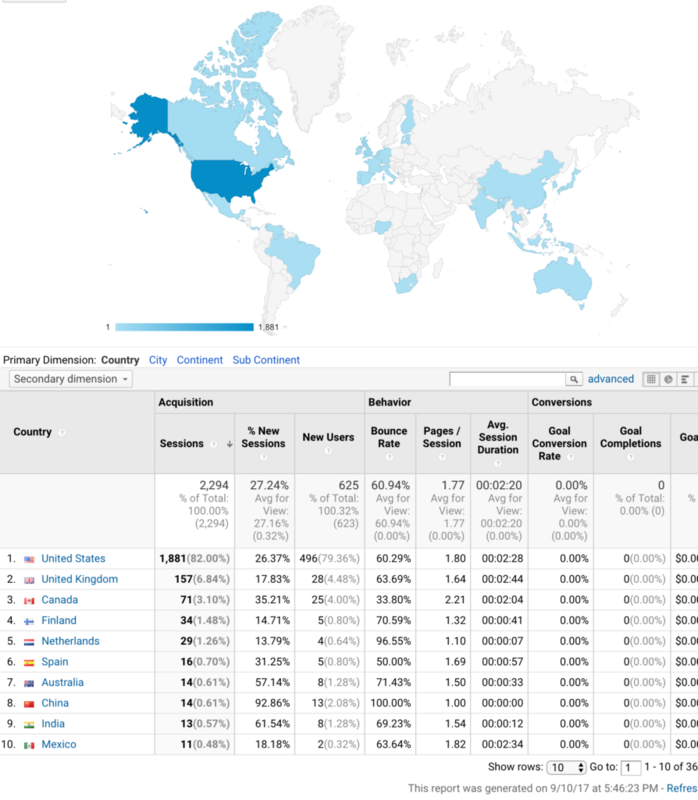 The top 10 visits were from US, Netherlands, Canada, UK, India, Australia, Ireland, Vietnam, Israel and Romania, using 8 Languages besides English. 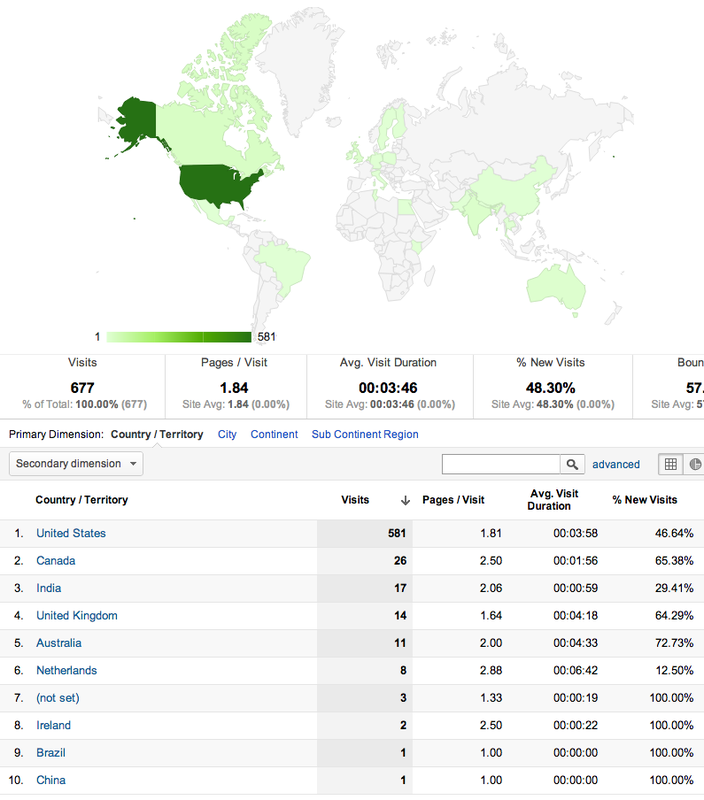 Visitors from 22 countries around the world August 8 to September 2, 2013. 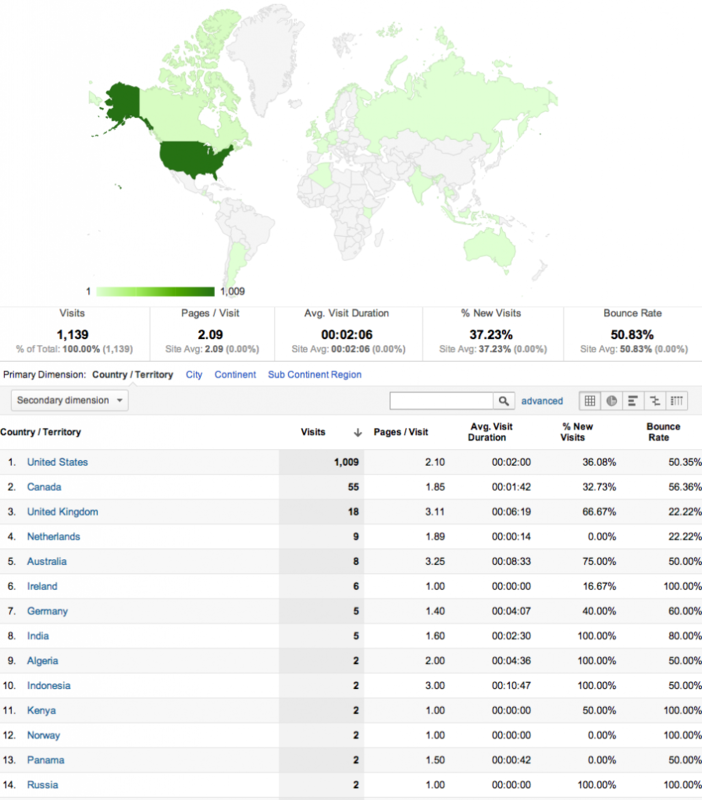 Visitors came from 48 states around the US (all but Wyoming and Nevada). Visitors from various countries around the world July 4 to August 3, 2013. Visitors from various countries around the world June 6 to July 6, 2013. Visitors from various countries around the world March 7 to April 6, 2013. 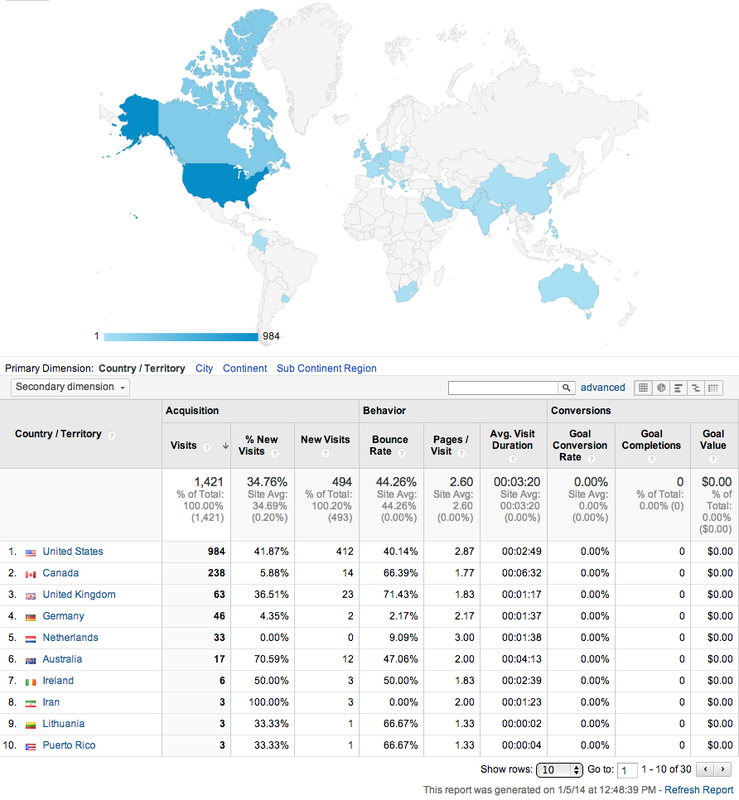 Visitors from various countries around the world January 10, 2013 to February 9, 2013. Note: The Calendar of Meetings was moved to this website during this time, hence the spike in the number of visits.